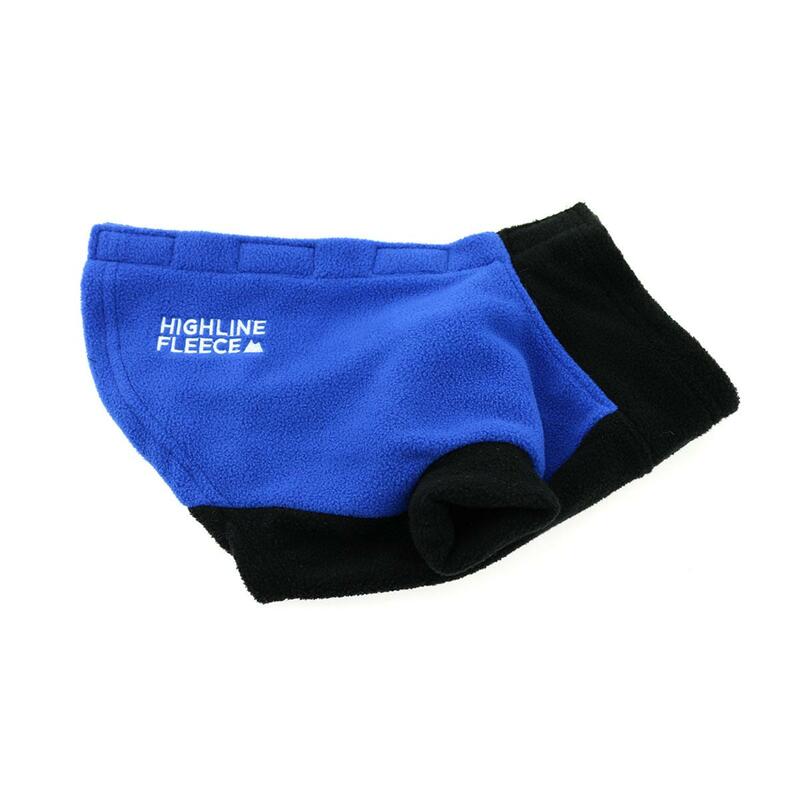 Keep your pup cozy with our new Highline Fleece Dog Coat in Blue and Black by Doggie Design. Posted On 02/01/19 by MJ H from Delton, MI Yes, MJ H recommends this product! I have purchased two of these coats for my crew. So far, so good! The step in + the velcro back closure was unique. I am always on the look out for clothing that is easy to put on, and stays on. I am glad that I gave these a try. Posted On 01/19/19 by Mary J from Naugatuck, CT Yes, Mary J recommends this product! great coat. now my dog has 2 of these in different colors. fits great. would recommend. my dog is hard to shop for in clothes but this site usually has what I need. Posted On 12/09/18 by Susan B from Green Valley, AZ Yes, Susan B recommends this product! I bought 7 of these wonderful fleece jackets in different sizes. They are comfy and warm. My dogs love them. I love the high cut tummies and the easy velcro closures. The space between the velcro is perfect to hook the leash. Posted On 12/04/18 by Alexandra C from Seattle, WA Yes, Alexandra C recommends this product! Posted On 12/01/18 by Susan B from Green Valley, AZ Yes, Susan B recommends this product! My 7 dogs love these fleece jackets. They are sized perfectly. The high cut tummy is perfect for my little boys. I love the velcro on the back to close it. The leash fits onto the harness or collar between the velcro spaces. We love it. I bought 7. AND they are warm and cozy. Posted On 10/26/18 by Cole from Albany, NY Yes, Cole recommends this product! This item holds up to washes and is nice and thick, well made! It is extremely easy to put on fast for quick pee runs in the cold upstate climate. A step-in fleece jacket with back closure that fits an 88 pound American Bulldog? Yes, please! I ordered this jacket in sizes 16LC and 28. The size 28 fits my 88 pound American Bulldog in the neck & chest, which makes me very happy. His measurements are chest 39", length 26", and neck 24". Love the step-in with back closure features, because it is so easy to put on & remove. Another great design feature is that the size 28 recognizes that dogs fitting this chest measurement have a proportionately long distance between their necks & the tops of their legs. 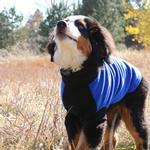 This jacket provides all the coverage without any sad drooping down the pup's chest. The paper tag claims that size 28 is for a dog with length of 31+" and girth of 42" and that the jacket is machine washable. The interior label calls for handwashing, but who wants to fuss with that? The 16LC needs to be returned, because the armholes are too tight and restricting, and thus uncomfortable on the smaller pup for whom it was purchased. These armhole seams are rigid and too small. Overall, love the colors and big dog sizing. Posted On 02/12/18 by Heather from Canada, Yes, Heather recommends this product! This is such a great fitting coat according to the size chart. It fits my dog perfectly. He's a pittie with not much fur and in canada this helps him stay warm. He seems to walk better and longer when he has his coat on. I will buy more in other colors in the future. Posted On 12/23/17 by April A from Ooltewah , TN Yes, April A recommends this product! This jacket was a perfect fit for my dog! I measured according to the chart and it fits like a glove. It is very warm and well made. Wilson says “thanks”! Posted On 12/12/17 by diane k from Lancaster, NY Yes, diane k recommends this product! Omg!! This is sooo cute. Looks adorable on my dog. Soft and warm. Keeps his belly warm where other coats don’t . Highly recommend ! Posted On 12/09/17 by Cade O from Santa Rosa, CA Yes, Cade O recommends this product! I am a previous Fido Fleece owner. This product is exactly the same EXCEPT they cheeped out on the Velcro. It used to have a 1" piece at the neck and then a space for the harness to come through and then the Velcro went all the way to the end making it seamless. The dog would step into the front paw holes and you pull up and seal the Velcro down the back. NOW they only put (3) 1" pieces down the back and they puff up. Other than that still a great item and you will love the ease of use. Great for snow or wet weather but not so thick that you can't use it all year long. Measure you dog, they are very tailored once on. Posted On 12/04/17 by Marilyn P from Newburgh, IN Yes, Marilyn P recommends this product! This fleece is very soft and warm. Fits great! I love the way my dog can step into it. Posted On 11/27/17 by Marilyn P from Newburgh, IN Yes, Marilyn P recommends this product! Love this soft fleece. Very warm and easy to put on. Fits well. Posted On 11/19/17 by christy b from New York, NY Yes, christy b recommends this product! Love it. Only wish closing on back was a single strip of Velcro rather than random patches. Posted On 11/18/17 by Patricia C from , NJ Yes, Patricia C recommends this product! Very soft and warm. Did not wash yet so do not know if it pills. Will update. They have cheapened them up! Posted On 11/13/17 by carol m from grand rapids, MI Yes, carol m recommends this product! Looks good on my dogs, they can't get out of, easy opening. I love this. I have ordered more. They are true to size. Easy on and off and keeps my little guy warm. Posted On 11/02/17 by Eileen A from St. Paul, MN Yes, Eileen A recommends this product! I love the warmth of this coat for my tiny Yorkie mix. It's perfect for our Minnesota winters. I love this little jacket. It fits Ollie perfectly, and is made with a good quality fleece, not some flimsy kind. My only critique would be that the Velcro closures were all one and were the length of the jacket. It tends to "buckle" where there is no Velcro. Posted On 10/24/17 by Cheryl T from Saylorsburg, PA Yes, Cheryl T recommends this product! Took measurements as recommended and ordered 12lc...fits my rattie like a custom-made vest. Will keep him cozy in our very drafty house. Posted On 10/23/17 by Nancy A from Cape Cod, MA Yes, Nancy A recommends this product! Just purchased 2 Blue coats for my Shih Tzu. They will be nice and warm this winter. Posted On 10/20/17 by Lisa W from Centerville, UT Yes, Lisa W recommends this product! 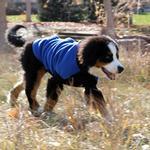 We really love these easy step in jackets for our pups. They even keep their chests and belly's warm as the days are getting cooler! I only wish this came in a little longer option for my little min-pin. Watch the sizing information on each item you buy Not all brands have the same sizing chart.